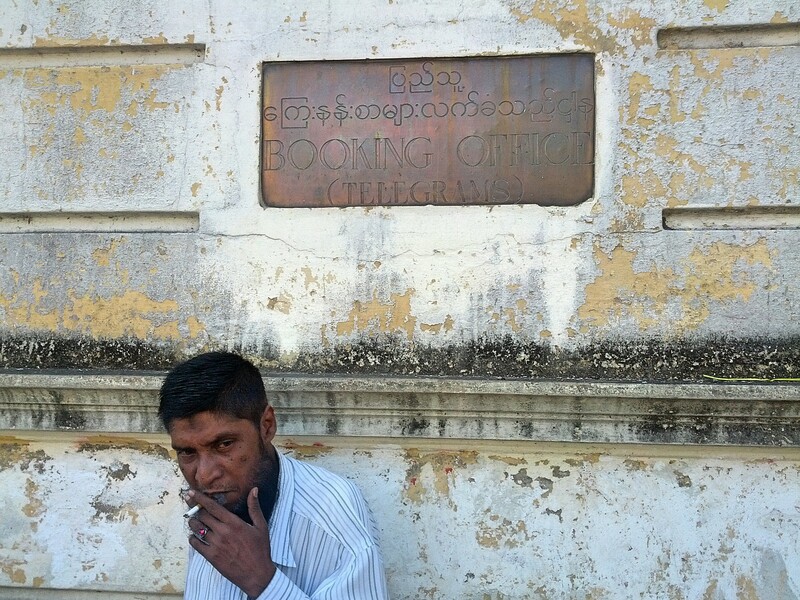 An Indian man stands in front of a rusted sign outside of the booking office at Yangon’s Government Telegraph Office, where telegrams can still be sent domestically for $0.30USD/message. On a street stacked block by block with colonial British buildings, the Government Telegraph Office doesn’t instinctively stick out. Like so many of its neighbors, the façade is grimy and crumbling. There always seems to be a soft trickle of water flowing from exposed blue plumbing pipes, which water lively patches of ferns and moss that crack through the pediment. At the bottom of its foundation, walls that were whitewashed long ago can be seen cracking and peeling like a bright white egg losing its shell. But the looming telecom tower perched upon its northeastern corner nonetheless makes this British relic distinguishable. 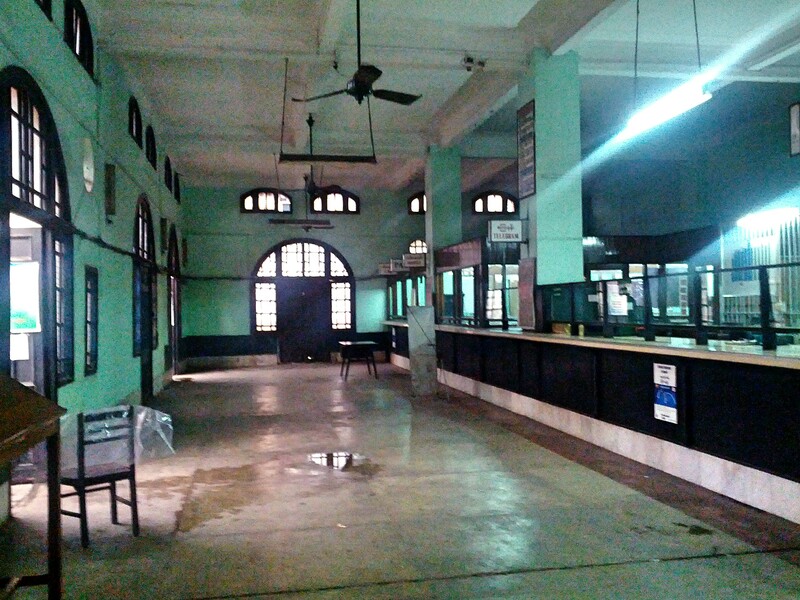 Today over a century old, the building is now administered by Myanmar’s national telecom company, MPT, but two counters at the booking office accessible by the public from Mahabandoola Street still offer customers a service not available by its new foreign competitors, Ooredoo and Telenor. Crossing the blaring traffic of Pansodan Road one blistering day, I noticed a young pair of women going into the main office and up to a counter with a sign reading “Telegram.” After approaching the counter, the older of the two women fussed with her dark blue tamein as she gathered her documents. She handed over a card to the man behind the counter, a type of e-payment card not dissimilar from one you’d find linked to modern electronic public transit systems. She was sending an e-telegram by debiting 300 kyat (0.30USD) from the card. And the message would be ready to reach her relatives in upland Myanmar the next day. Telegrams are still popular in Myanmar, where the service is provided for domestic messages only. The mode of communication is seen as affordable and dependable, especially for those looking to send messages to poor and remote parts of the country. With a chuckle and a nod, the counter clerk confirmed to me that the telegram is not as popular as it once was, but that about 50 people still come every day to send e-telegrams, necessitating the payroll for the three men that concurrently service the telegram and collect call counters. The office also has counters for sending emails, using the internet and faxing. A row of telephone booths stands across from the fax counters, all of them empty but for a shelf where a rotary phone was once placed. They appears as if they belong in a museum. Indeed, the wide open booking office feels like an echo of its former self. Though often empty save for a couple of customers, it isn’t hard to imagine the throngs of people that once gave this room a very different life. Today the only sounds that can be heard, however, are the rattling of ceiling fans and the clinking of an antique cash register made by US-based National Cash Register (NSR) Company, a machine that is as old as the building itself. If I believed in ghosts, this would be a place they would haunt. The Government Telegraph’s main office, where telegrams, faxes, email and other forms of communications can still be sent. It’s true. 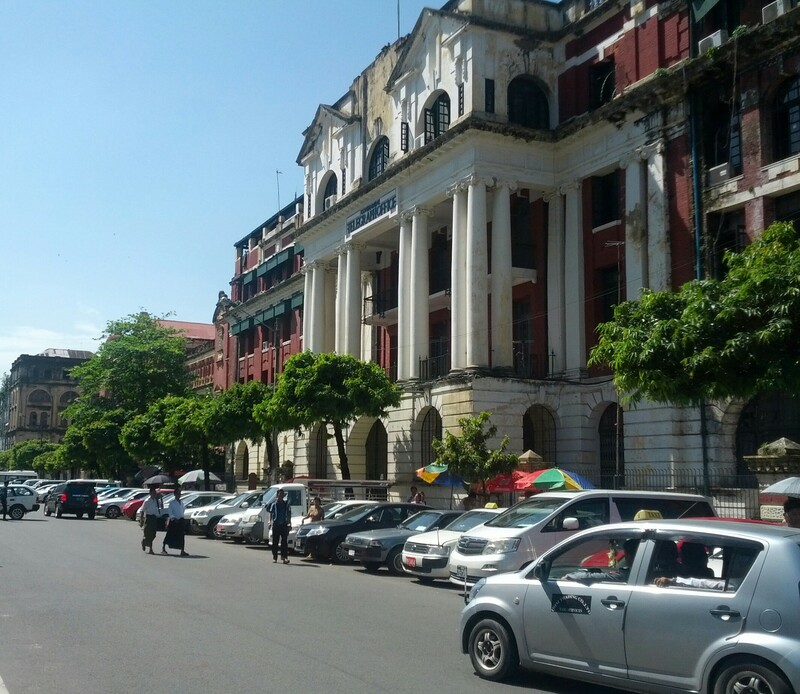 Myanmar is rapidly modernizing, but in downtown Yangon the throngs don’t move that far. Just four short street blocks to the east of the Government Telegraph Building, men, women and teenagers nosily line up to get new SIM card, recently made available by Norway’s Telenor. On Telenor’s launch day, Yangon’s streets were abuzz with an intangible air of excitement. I overheard two men, hunched down on short plastic chairs, the typical teashop squat, discussing Telenor rates while snuggly fitting in their new chips. Everywhere you could see the small blue packets proudly displayed on restaurant tables with new SIMs enclosed. Later that night at Mahabandoola Park, I abruptly walked up to three policemen only to notice that they were too busy hovering over a mobile phone screen to see that I almost walked into them. The glow of a Huawei display lit up their faces, making them appear entranced as one of them scrolled through an internet page. You are much more likely to run into one of the former scenes today than to here of someone sending a telegram, but that doesn’t mean that most of Myanmar still isn’t dependent on simpler forms of communication. The overnight drop of SIM card prices from approximately $160 to $1.50 has predictably sent mobile penetration to between 10% and 15% — maybe higher. Yet it shouldn’t be overlooked that the value of a telegram will not be overridden so quickly. Not in Myanmar.